!t’s summer. It’s hot out. You don’t want to cook. You don’t want fuss. 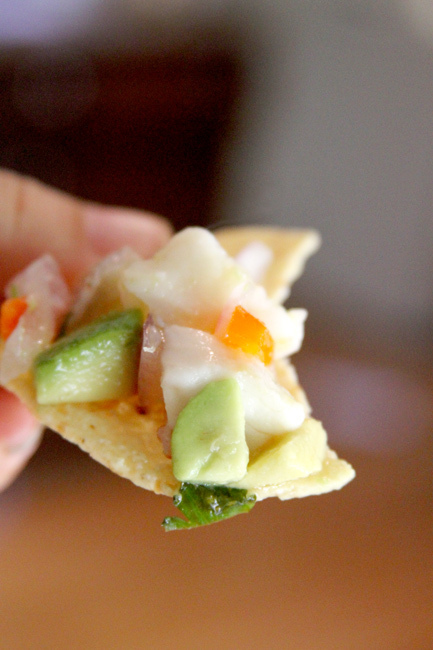 You want ceviche. It’s bright, fresh and cool. 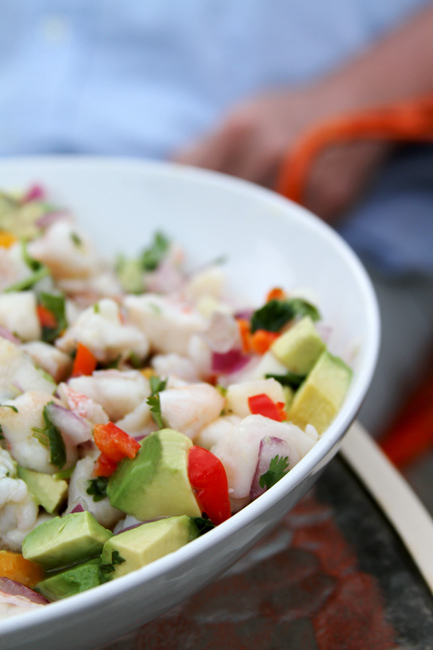 This Central and South American costal dish is the perfect summer dish. It’s fresh seafood marinaded in acidic liquids – generally limes or lemons – in which the citric acid causes the seafood proteins become denatured. Once this process is completed you mix in the contrasting flavors in the form of red onion, chili peppers, avocado, cilantro, olives, tomato, orange juice, tequilla, sweet corn, grapefruit – you can find a tradition for any of these ingredients. Sometimes olive oil or sweetener are added. Just use whatever you think would taste good. Your seafood could be anything you like – ocean white fish fillets are generally recommended but you could use whatever you like, from oysters to conch to farm raised tilapia. I used bay scallops, tiger shrimp & ocean perch. For a serving vessel, I love some freshly fried tortilla chips, but any salty or buttery cracker or toasted bread will do. Submerge the fish into the juice, cover and let sit in the refrigerator for 2 – 4 hours. This will mainly depend on the size of your fish chunks. The fish is done when you cut a piece in half and it is firm and white all the way through. If you’re making this ahead; be sure to drain off the juice or your fish might get too acidic. When you’re within an hour of serving add in your diced bits except for the avocado. Right before serving, salt, and add in whatever flavor enhancers you would like, if it’s a little too acidic add in a bit orange juice or honey. If it tastes a little flat, add some olive oil. Lastly, carefully fold in the avocado chunks.